Urban Stitch Studios is the only studio in Northern Nevada to offer this unique way of teaching children and teens to sew. 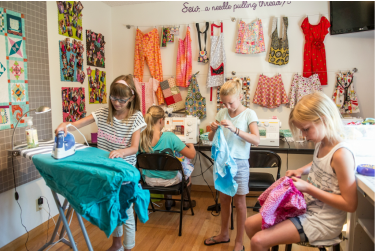 Students as young as six years old can be taught to sew with a sewing machine using the Kids Can Sew™ curriculum which includes clothes, purses, pillows, doll clothes and fun novelty items. Patterns are designed specifically for children with an intuitive approach to learning. Urban Stitch Studios designed and commercial patterns are introduced as students advance within their personalized program. All classes are small with an emphasis on individual instruction. Use of sewing tools, i.e. scissors, pins, seam gauge, markers, rotary cutters, templates, rulers, iron, etc.